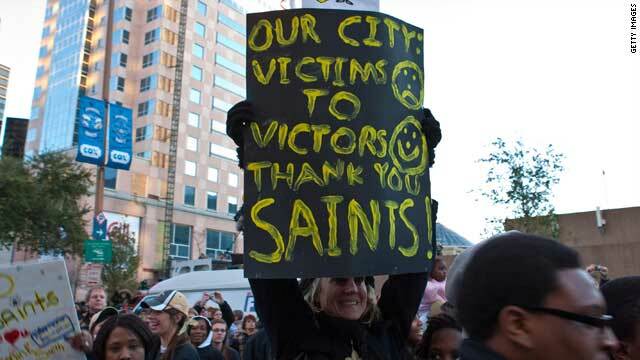 New Orleans residents, who had to flee the city in Katrina's aftermath, show their appreciation to Super Bowl winners Saints. Editor's note:CNN's monthly feature show Revealed profiles New Orleans mayor Ray Nagin as he approaches the end of his tenure in May. This is one of a series of articles looking at Nagin's legacy and the impact of his mayoralty on the city. (CNN) -- When talismanic quarterback Drew Brees led New Orleans Saints to their first-ever Super Bowl win last month, a wave of optimism flooded the low-lying coastal city that was decimated a few years ago by Hurricane Katrina. Swarms of ecstatic fans took to the streets for days, dancing to the sounds of roving brass bands as a caravan of colorful floats from the Mardi Gras parades brought the party to different parts of the storm-ravaged city. For New Orleans' tormented citizens, the Saints' historic win, which coincided with the annual celebration of Mardi Gras, was not just a sporting triumph. More than anything, it boosted a feeling of optimism and resurgence for thousands of people across New Orleans. "We are not labeled victims any more, we are champions," Lawrence Harvey, a resident of the Lower 9th Ward, the area worst hit by flooding, told CNN. Video: New Orleans Mayor Ray Nagin speaks to CNN about his legacy as he comes to end of his tenure. "That means everything to me, because we don't want people to feel sorry for us. We know we are loved because people from all around the world came and helped us rebuild. This is their championship too, we couldn't have done it without them," Harvey added. Spirits have never been higher in a city that, nearly five years ago, was almost wiped off the map. Once mocked as the "Ain'ts" -- it took the Saints more than four decades to reach the Super Bowl -- the history of the team and its stadium, the imposing Super Dome, is inextricably linked with the city's emotions. In the aftermath of Katrina, the Saints were forced to flee New Orleans -- like almost every resident of the city -- when the storm's blistering winds destroyed nearly 70 percent of the stadium's roof. Super Dome instantly became New Orleans' most recognized symbol of despair. 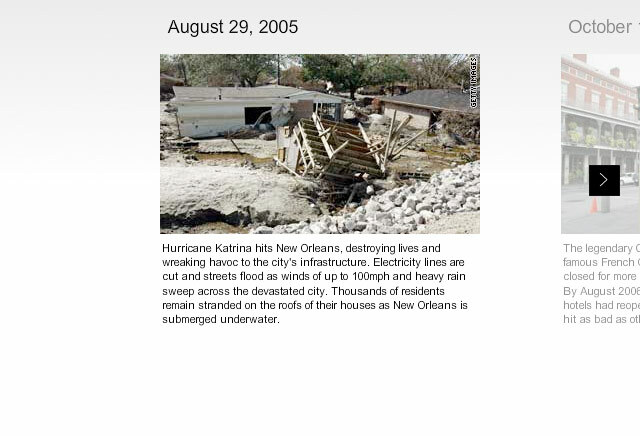 Thousands of Katrina's victims sought shelter to the building, remaining stranded for days amid a scene of garbage, chaos and darkness. For New Orleans' mayor Ray Nagin, the psyche of the people is the most critical issue when it comes to recovering from a disaster like Katrina, which devastated more than 90,000 square miles of land and claimed about 1,800 lives. 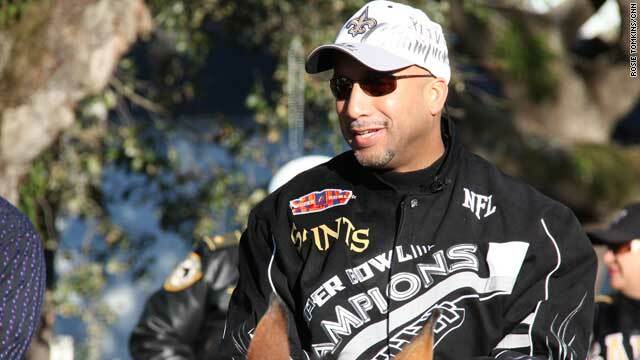 "When we won the Super Bowl, it was like a veil of frustration, despair and negativity was lifted from the eyes of just about every citizen," Nagin told CNN. "All I'm hearing around the city now is, 'oh my God, we are recovering, we are doing great.' It wasn't until that moment that people's eyes opened up to what we were doing collectively," he added. We are not labeled victims any more, we are champions. "Mardi Gras is almost like a religion for the city of New Orleans, we have been doing it for hundreds of years," said Nagin. "And with the Saints winning the Super Bowl, there is a glow and an incredible attitude in this city," he added. With Mardi Gras and football glory behind them, New Orleanians have all the rights to feel optimistic about the future -- even though the city has a long way to go before fully recovering. "We are in the rupture and it feels really good," Clancy DuBos, editor of Gambit Weekly newspaper in New Orleans, told CNN. "The Saints proved to us that no matter how many times you've lost in the past, if you work together and forget about egos and skin color, there's no limit to what you can accomplish," he added.